Happy Friday! Today I am sharing a guest post written by Matteo, who blogs at Blobally. Him and his brother take the most beautiful travel photos, the kind which make you gasp as you scroll through them. Right now they are on an amazing journey in Nepal, somewhere that always remains close to my heart, and they are documenting it all on their blog! You have to go and check out the photos on their blog, they are seriously amazing! Today Matteo is here to share his amazing adventure, and his photos about an incredible trip by caravan. Over to you, Matteo. Hi folks! My name is Matteo Fabi, 27, from Bari, south of Italy. I graduated in Economics, moved to London and started a career in logistics and retail, but pretty soon I got bored of the ordinary life. I have always been fond of travels and journalism, as many dreamers before me I turned down my job, grabbed a camera and bought a one way ticket to Nepal, where I’m writing to you from. I share my passion and sometimes my travels with my brother Enrico. You can find both of us on Blobally, a sight of the world through our eyes. A little preface: both my brother’s laptop and mine were stolen in Sarajevo, so the pictures until the Bosnian capital are just the few we could recover from the camera’s memory drive. I put a couple of Creative Common photos, with a link to the author’s page, to give a better image of some places. Sitting at my desk in Kathmandu, sometimes I really miss the sea. I come from the beautiful region of Puglia, land of white beaches and light blue sea. Often, I wonder why I moved to London first, then the Himalayas. It seems I’m moving on purpose as far as possible from the shores. But Marcella gave me the chance to dive in my memories. They are not even remote memories. It was August 2014. It was finally time to get my holidays and leave a surprisingly warm London, for a trip I planned far ago. A trip to the Balkans from my hometown, Bari, with my brother and two of my closest friends, aboard our brand new (second hand) caravan. And this is how it happened. Four countries, four brothers, fourteen days, no plans. Just hitting the road day by day. The guys actually moved first. I found the cheapest fly to Perugia, at the very center of Italy. The guys came to pick me up at the airport, and we moved straight away. I left every commitment behind me in a snap of fingers, looking at the highways passing by, loosing my sight beyond the horizon, dreaming of an unpredictable, fascinating journey. Within a bunch of hours we arrived at Trieste, just next to the border with Slovenia. None of us had ever been there before, and it was dinner time, so we decided to stop and enjoy the sunset. And here we had the first surprise. While, holding a mojito, I was letting a nice local maid explain me the architecture of the beautiful Piazza Unita` d’ Italia (lit.Unity of Italy Square), someone tapped my shoulder. I couldn’t believe it. A couple of long time friends, from Bari like us, Linda and Ugo, were standing just in front of me. I completely forgot that Linda found a job in Trieste, but, actually, they had literally JUST come back from the Sziget Festival in Budapest. It was clearly the case to celebrate properly. We locked ourselves up in one of the most picturesque bars I’ve ever seen, “da Marino”. With Marino at the counter, of course. The proper service of Marino left us a little bit worn out. But Enrico and Pier, with quintessential bravery, decided to drive straight to Slovenia by night. Excess of adrenaline, I suppose. I fell asleep as a baby, and woke up, alive, a little bit dry, in front of this view. Built within a cave mouth, the mighty Predjama Castle stated we were in Slovenia. I suggest you to read something about this fortress, from a besieged knight who used to throw cherries to the enemies, to†the feature in a movie with Jackie Chan. Nevertheless, there was no time to dawdle. 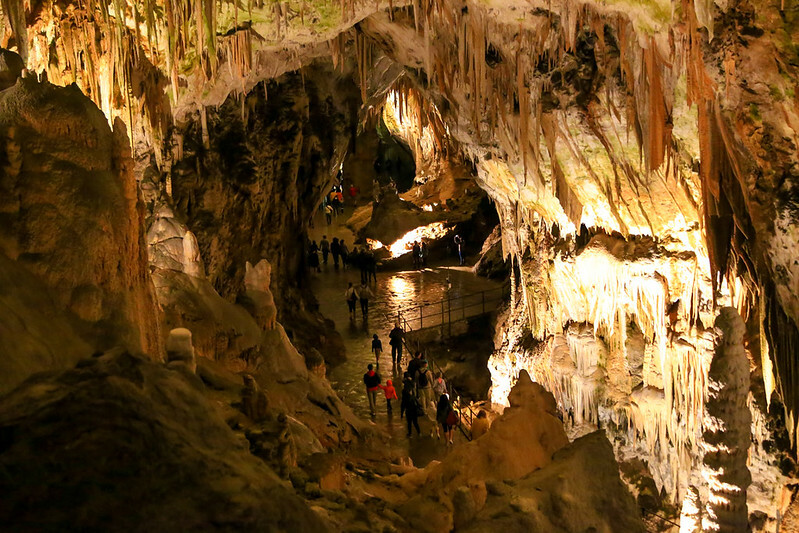 Just 11km far you’ll find the Postojna Cave, which is actually long 20km! A 5-minute cave train, and 2 hours walk, brought us closer than ever to the Earth’s inner core. It might seem we rushed it, but on the same day, late afternoon, we headed directly to Croatia, in order to spend a night.. on an island. Krk is the biggest and the most inhabited island of the Adriatic sea, and one of the few connected to the mainland by a bridge. We first had a dinner at Krk town, an ancient tiny port caressed by a fresh breeze. We also got along with some friendly guys from Zagreb, sharing drinks on the rocks by the seaside and telling each other stories from the two sides of the Adriatic sea. The island’s capital was anyway kind of too “touristic” for us. Our mission was to be wild. So, asking for a wild place to spend the night on, we have been sent to Stara Baöka, a remote fisherman’s port at the southern spot of the isle.We arrived at night in the darkness, and just the day after we realized that we took place right upon a steep cliff which hid a nudist beach. Nobody of us ever tried the experience before, so.. in a little while I found myself fishing seafoods with fins, mask, knife and nothing else. That’s pretty wild. From the seaside, to the forest. August is the month where partygoers move to the coast to get mad. For once, we promised ourself to try something different. So we headed to the inner region of Croatia. Since 1979, the Plitvice Lakes National Park is an UNESCO World Heritage site. Sixteen lakes. 16. One on top of each other, connected from cascades and gorges. And just forest all around. Do I need to tell you anything more? We fell into a bucolic dream, and just kept on walking, until the dusk. It was forbidden to camp, to light fires, to spend the night in the forest, to swim in the lakes. Sorry Croatian Authorities, I swear we picked up all the trash, didn’t light any fire, didn’t use any tent. We just let you lock us up at night in the park. Quite amazing playground, if you wake up at dawn and got it all for you. Has been really hard to leave this paradise, but we vowed we weren’t going to spend two nights in the same place. Boris, the concierge of the hotel right outside the park where we left the caravan, suggested that we stop at a place called Jajce, on the way to Sarajevo, “Because the road is not exactly an highway”. Then, we crossed the Bosnian border at Bihac, and, after a 4hr drive to cover 150km, we arrived there, as usual in the complete darkness. But when we woke up, another idyllic place was waiting for us. We had farm cheese, hams, and grilled trouts for lunch, in a local tavern simply put on a tiny isle in the middle of the river. Stomachs filled, time to go. After several more hours of driving, we finally arrived at the capital. Sarajevo is a blend of cultures: Islam, Orthodoxy, Judaism and Catholicism have been coexisting here for centuries. The repercussion on the architecture in the old city is just fascinating. Bosnian are great craftsmen. The graveyards of the war during the ’90s, even if candidly kissed by the sun, are the memento of a lesson which human beings seem to be hard to learn. Did I mention we arrived at night? It’s becoming pointless, isn’t it. Mad night. No pics about it. Taxis are very cheap. As mentioned in the preface, we were about to join the crazy flood of supporters of the Sarajevo football club in an epic UEFA Champion’s league qualification round against the Deutsche from Mönchengladbach. I almost had a heart attack once I saw the door of the caravan open. Laptops were gone. We decided to leave straight away. 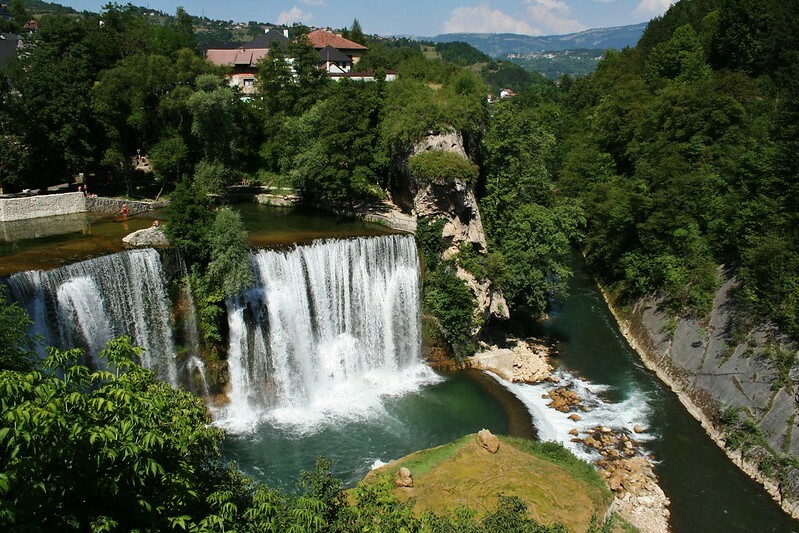 We moved to the Herzegovina region. “Mostar” comes from the old name of the inhabitants,†mostari, which means “bridge keepers”. Guess why? The Stari Most (lit. Old Bridge) was commissioned by the Ottoman Sultan, Suleiman the Magnificent, and completed in 1567. Bombed during the Bosnian War in the ’90s, has been rebuilt in 2004. At the beginning, we were told that the young boys of Mostar have to jump from its 24mt to prove they are men. Later on, we questioned some local friends we made, and they told us: “Bllsht!”. It’s just a way to let the dumb tourists pay the “diving club” fee. We felt better, feeling free of considering ourself not-jumping men†(and not dumb-tourist, but travelers). Later on we even dived from the 10mt “training” spot. It was fair enough. Then, the caravan gave us the first problem. The battery was gone, we weren’t able to leave. Thankfully, the keeper of the parking area promised to come the day after with his friend/mechanic. So, pushed to break the rule of 2days/2places, we couldn’t do anything but chilling. We found out a nice bar, the Ali Baba, so called because staged†in a cave, and then wandered throughout the mystic atmosphere of the old city by night. The day after, as promised, the park-keeper knocked on our door with the mechanic, who, in the time of a coffee, went to buy a new battery and put it on. Let me spend a word for Bosnians: some of the politest and kindest people ever met in my life. Back on the road. Once again on the comfortable Croatian highways, we agreed that was time for a further dose of sea. The finger fell on the map: Split. Spalato (in Italian) was the capital of the Dalmatia province under the Roman Empire. Its astonishing old city is dominated by the Palace of the Emperor Diocletian. Time to make our way to Italy. Pier had just 10 days of holidays. Finance doesn’t give you that much time to breathe. We enjoyed the trip until the last possible second. Then back at the speed of light. In a bunch of hours we were in Milan, and after having brought Pier home for a quick change of clothes, we dropped him directly at the financial district of Porta Garibaldi. We first headed to the beautiful coastal area of “Cinque Terre” (lit. Five Lands), in Liguria. We left the caravan at Levanto, and after chilling on the seaside, we enjoyed the sunset taking some shots along the cycle/walk path “Maremonti“, which connects with tunnels several of the villages hidden in the folds of the steep cliffs. Strictly recommended. The day after the weather turned rainy, so, like geese, we instinctively moved to the South. A couple of hours drive let us find the sun in Tuscany. Was time for a further dose of culture, because we don’t like travelling as Vikings, just looking for prosperous†lands and pleasing maids. So we stopped in Pisa to admire the renowned Torre Pendente (lit. Leaning Tower), which takes place in the breathtaking Campo dei Miracoli (Field of Miracles). Later on we also went to have a look at the “Normale” University, long-time institute of excellence. Even if having fully satisfied our brains, we felt the need of pondering the importance of culture, education, classic architecture, and how only the finest art can really survive the centuries. So I called Martina, former flatmate in London, exquisite bartender, which lives in Livorno, about 15km far from Pisa. With the extreme kindness and pleasantness of her†and her friends Jessica e Alessia, we finally found a good reason to spend two nights in the same place. And this is it. Sadly, I realized I barely had the time to cover the 770km in between Livorno and Bari, and catch my flight to come back to London. Sometimes comes back to my mind when, while wandering through the Balkan forests, my brother once told me: “Do you imagine, travelling this way forever?”. In the end I missed that flight to London, but not because we were late. I took it the day after, and several more flights after that. Several ones are yet to come. Thanks so much for sharing your story, Matteo! Wow! What a great road trip, my favorite thing to do! I’ve been to most of the places, and your photos are stunning, but you gave me a few ideas! It looks like a great road trip, and you guys sure got to see a lot! I hope Matteo is okay and wasn’t impacted by the earthquake. I emailed Matteo, and he is safe in Nepal, thankfully! What an incredible trip – and as you say, beautiful photography. Glad to hear Matteo is ok.